Medical Pack 300 Supplies Only. Medical Supplies for the Medical Tote. The medical bag is not included. EMT or Advanced Medical Bag Supplies. 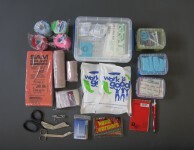 These Supplies are for the SlingPac 1 Medical Pack. Supplies only for the SlingPac 2 Medical Pack.